I rushed home with the ruby red gladioli for my mini dinner party. The food was ready. I needed to grill aubergines for the raita. Ditch the dress and heels in favour of denim and flip flops. Then welcome my guests smile on face, vintage Bollinger in hand. Of course, nothing is ever as simple. I drained and shoved the sliced aubergines into the grill. The lamb curry was still partly frozen. Nowhere near ready to be reheated. Then my guests arrived. On time. A few minutes of chit chat later, I led them into the kitchen. By this time the aubergines were on fire. Dark clouds of black smoke had filled the kitchen. My guests sat amidst it all trying not to look alarmed, while I waved the tea towel in the air in a lame attempt to improve air circulation. Some clever lady said “perfection is a road, not a destination”. How true. And equally applicable to the Saag Paneer or Palak Paneer I cooked for them. Not entirely satisfied with the recipe I posted on this site yonks ago, I tried my hand at it again. And if the guests were to be believed, this was the perfect saag paneer recipe. Simpler than the other recipe too. Chop the block of paneer into even bite sized pieces. In a bowl, mix the paneer pieces with the turmeric, chilli powder and a teaspoon of salt and set aside. Now, chop the onion roughly and mince or puree the ginger and garlic together. In a non-stick pot, bring the oil to heat over a high flame. When it is hot, add in the paneer and fry on one side until golden brown and then flip over and repeat on the opposite side. Then remove it with a slotted spoon back into its bowl. In the same oil, fry the onions, ginger and garlic next. When it starts going translucent, mix in the cumin and the chopped green chilli. Fry for about five minutes until the mixture turns a deep golden brown. Now mix in the frozen spinach and let it cook for another five minutes. When it is thoroughly defrosted in the pot and mixed evenly with the masala, add half a cup of hot water and go in with a hand blender to liquidise the whole lot into a smooth, creamy mixture. If you don’t have a hand blender, you could tip the spinach into a normal blender for the same result. When it is smooth and back in the pot, add in the fried paneer pieces and the garam masala. Lower the heat and simmer for 10 minutes until the water dries up and the spices have penetrated the spinach thoroughly. At this point, check for salt. You’ll need to add a fair bit to lift the spinach. But this dish is worth it. Eat it piping hot as a side dish or with some ready nan as a complete meal. mallika, nice heathy recipes. thanks for sharing. No tomatoes, no cream ..I like this recipe! OMG..good for you..I would’ve just ordered a pizza! So fresh and flavoursome! Can’t wait to give this a try. I looks delicious Mallika! I think you handled the situation perfectly! This saag paneer looks awesome! Looks simply delish! I love the idea of using a hand blender right in the pan, saves on so much time. can i use fresh spinach instead of frozen spinach? I’ve been reading your posts for a while and quite like your flair for cooking and easy tips! A small suggestion: Don’t fry the paneer… Cook it for a while in the spinach mix and then cover and simmer for a wee bit.. The paneer will melt in your mouth and would have absorbed the assorted flavours as well! Hi Tanya – lovely to hear from you! I’m not a big fan of frying myself but in this recipe it really helps to seal the paneer with the marinade spices and prevents it from falling apart in the spinach later. It will still melt in your mouth and absob all flavours – just be more pliable and better looking in the pan! Don’t you hate it when the guests are exactly on time?! i finally made saag paneer.. and it was awesome!! thanks mallika.. im proud of myself..haha. I just tried this and I am waiting for the rice and naan to finish to go with it! I am so pleased because it tastes just like the Saag Paneer at the Indian restaurant where I work. To the people who asked if you could use fresh spinach, yes you can! Just add it gradually while constantly stirring it to get the volume down if you have a regular sized pot. Otherwise it will overflow. Thanks Mallika! Also, you can use garlic/ginger paste to substitute the chopped ginger and garlic. Brilliant – I received a copy of your book for Christmas and tried this recipe – really nice, Mallika. I’m wondering if the addition of a little cream or yoghurt to the spinach might be a plus? Hi Keith – so thrilled it worked out! Go for Greek yoghurt if you must… nice and creamy but not as fatty as cream. This is glorious! Perfect mix of spices, just the right amount of heat. I’m a massive fan of saag and have never made it before. Wow! Heaven. Thanks. I made paneer last night, for the first time, and now have to come up with something to have with it! 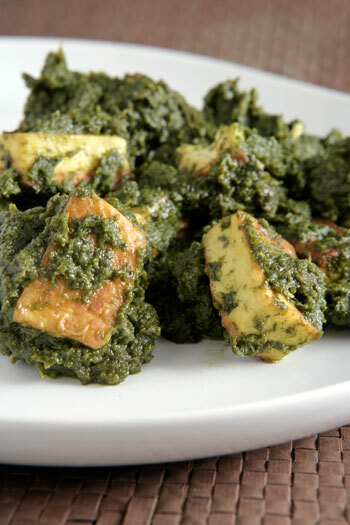 Your recipe looks to be perfect for a first try at saag paneer, one of my most favorite Indian dishes. Thank you! Ha ha yes Lyle… although you have to be able to deal with the unavoidable girly banter!! Made this last night. Yum! I added just a splash of lemon juice to brighten the flavour (my spices are old and need replacing.) Thanks! Some time we add too much Red-Chilly-Powder in curry… by mistake; how is it possible to readjust the taste or is there any way to decrease this hot taste…. I just made this dish and it is the best Saag Paneer recipe I’ve found yet! Simple to do and so delish! I left out the finger chili and it was perfect alongside a spicy chicken tikka masala I also made. 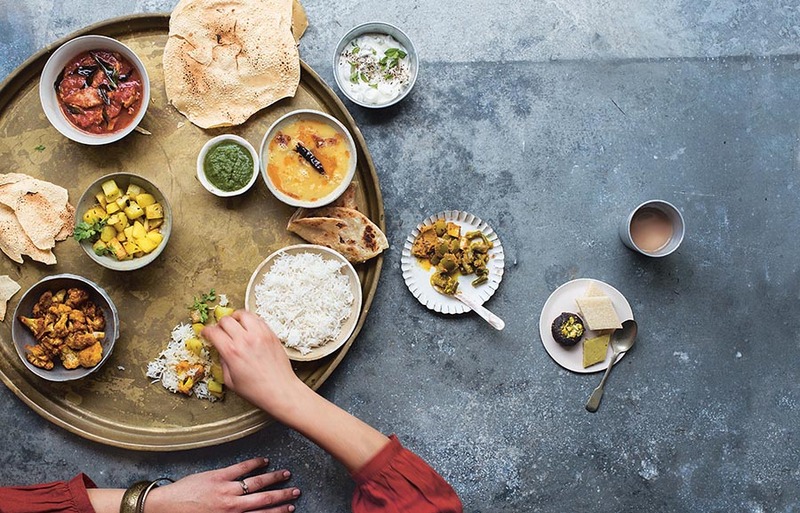 Thank you so much for posting this version of Saag Paneer!